These vegan, gluten-free pear muffins with ginger are moist and delicious with juicy chunks of pear, fresh ginger and crystallized ginger. They are perfect for breakfast, dessert or snack. 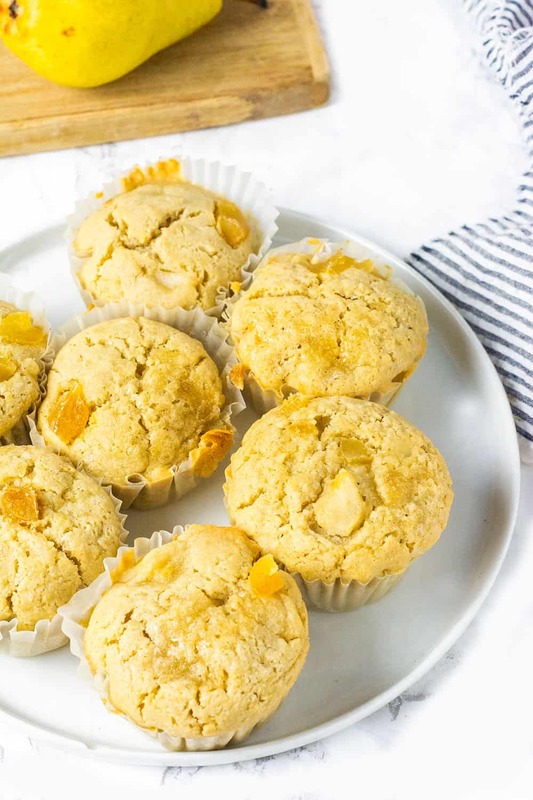 If you haven't tried the combination of pear and ginger in a recipe then you have to try this perfect matrimony in these pear muffins. 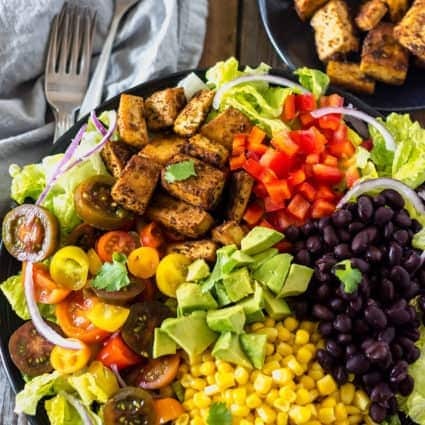 Since making my pear ginger green smoothie recipe, I have been wanting to make more recipes with this flavorful combo. The mild sweet taste of pear and the bold ginger makes these muffins a hit, my son Daevyd had 2 muffins. I used powdered ginger, freshly grated ginger and crystallized ginger. If using crystallized ginger, you can reduce sugar to 3/4 cup. These healthy muffins are also freezer friendly. I love to use Krusteaz all-purpose gluten-free flour blend because it is the best store-bought blend that I have used so far. It behaves like regular all-purpose flour, the taste and texture are amazing, I even used it to make Jamaican dumplings successfully. 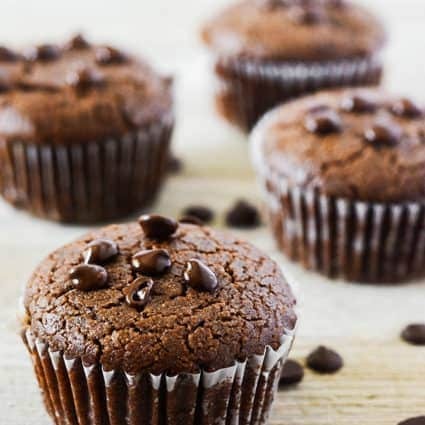 The almond flour is important to give that nice fine texture in your muffins. Mix the wet ingredients plus the grated ginger and add it to the dry ingredients stirring until the batter is smooth. Stir in the chopped pear and crystallized ginger. The first batch I made I used crystallized ginger and the second batch I made I omitted them. Although they both tasted great the ones with the crystallized ginger were definitely amazing! Make sure to oil the muffin pan or add liners and spray them or brush them with oil or else your batter will stick to the liners. Scoop batter in prepared muffin pans, using a 1/4 cup measuring cup or an ice cream scoop. Bake in a preheated oven for about 30-35 or until a toothpick inserted in the center comes out clean. 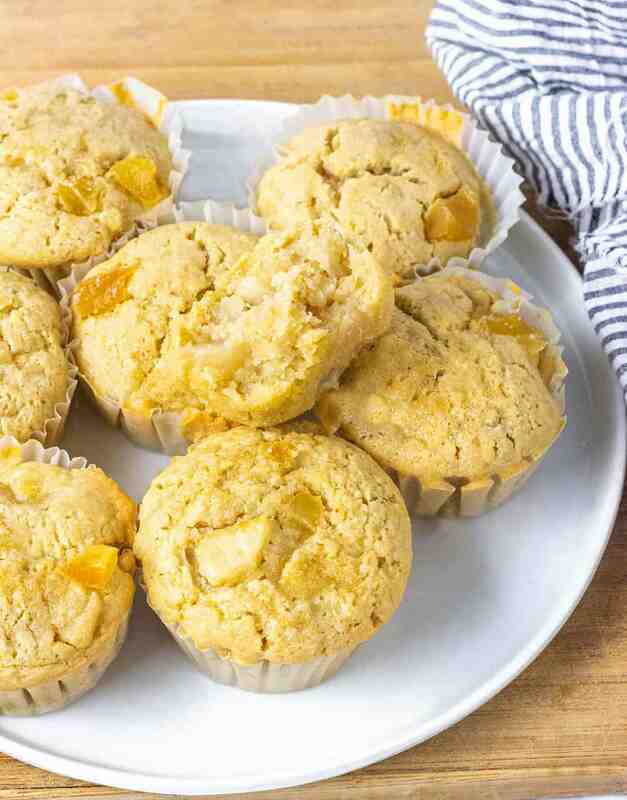 If you make these ginger pear muffins, snap a photo and hashtag #healthiersteps — we love to see your recipes on Instagram, Facebook & Twitter! Preheat oven 350 degrees. Line a standard muffin pan with 12 paper liners and spray or brush with oil. Set aside. 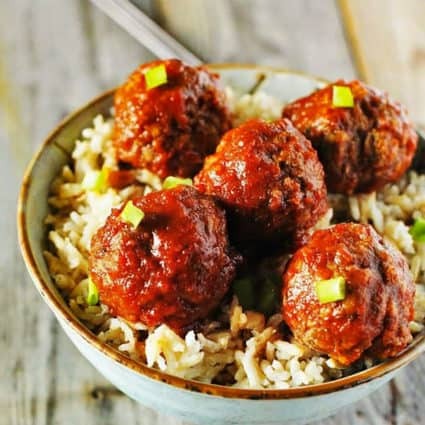 Combine all-purpose gluten-free flour, almond flour, cane sugar, baking powder, ginger and salt in a large bowl. In a medium bowl, mix almond milk, coconut oil, and ginger. 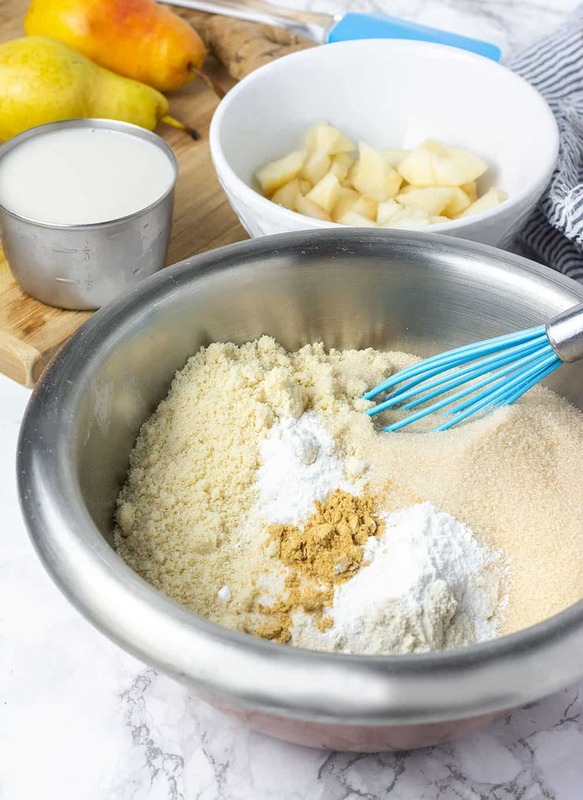 Mix both dry and wet ingredients together until batter is smooth. Stir in the pear chunks and crystallized ginger. Using a 1/4 cup measuring cup or ice-cream scoop. Scoop batter into each of the 12 muffin cups and bake for 30-35 minutes. Ready when tops spring back with gentle pressure or until a toothpick inserted in the center comes out clean. Cool muffins in pan on a wire rack for about 10 minutes then remove from pan. They are delicious served warm or completely cool. Thank you Pongodhall, I’m happy you enjoy them.